Do something completely different and enjoy genuine Swartland hospitality while making wine hands on in the old traditional way. Combine and hour or so harvesting grapes with working in the cellar, eating a delicious country lunch, tasting wine and having lots of fun. Ideal for teambuilding or for groups of friends and family. Overnight R1,500 per person (comfy accommodation, dinner breakfast lunch, hands on winemaking, wine tasting, notes on winemaking and discussion with the winemakers as you make wine. Visit Fynbos by appointment to taste wine and stay overnight to make a getaway of it. Wine tasting can also be combined with delicious food. Wine and food pairing events are available for groups of 10 or more. 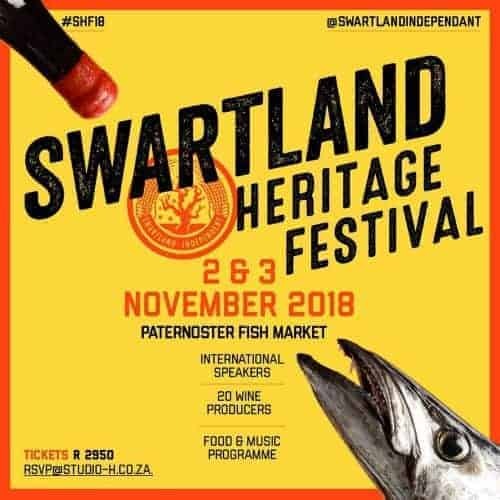 In November last year, the Swartland Independent Producers took over the West Coast town of Paternoster for an incredible celebration of Swartland wine and food. “During the two-day exploration and ponderation of our Swartland heritage and history, Paternoster will be home to these crazy winemakers. Informative tastings with themes, Speakeasies (of the gin-and- talking kind!) as well as an international guest speaker from Georgia will be some of the things people can experience over the two day festival,” said Craig Hawkins, baby boss of TESTALONGA and proud chairperson of the SIP. The Swartland’s best chefs and farmers joined a group of approximately 20 wine producers to share their fascinating stories. In between the serious wine tastings and talks, guests tasted Swartland inspired food and wine, enjoyed the company of fellow bokkom enthusiasts, and kicked back and relaxed with live music.